Out and Elected in the USA - The First 30 Years: 1974-2004 is a survey, through black and white portraits and texts, of many of the pioneering openly lesbian, gay, bisexual, or transgender individuals elected to public office in the US in those years. For information on a touring exhibit version of the collection, contact Ron Schlittler at rlschlittler@verizon.net. 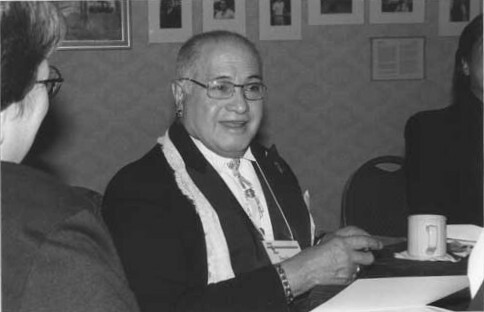 In 1961, José Sarria was the first out gay person to ever run for public office in the US. He did not win, but he made history. Sarria went on to found the International Imperial Court System and became better known as Absolute Empress I, The Widow Norton. Q: You made history when you decided to run for elected public office. What put that idea into your head? A: At the time that I ran it was because I saw a need. The only way that the gay community at that time could become forceful was to become political. I don’t care what people say, even one vote will make a difference. If enough people scream, it will make a difference. These people that say, “Oh, I’m not going to vote, I’m only one person, it isn’t going to count,” well, by Jesus Christ, it does count. If everybody had that attitude then nothing would be accomplished and we would be all screwed. Most everything I’ve done in my life was done with a purpose, not with a big purpose, at least not what it ended up being. At the time that I did this, I wanted to prove to these silly queens that by voting, it did make a difference. I wanted to prove that everybody had the right to vote. I wanted to prove that you had the right to run for public office. And the only way to make these people understand that, was to do it. So I decide to, with the help of some of the customers at the Black Cat. They said, “Why don’t you run for office?” So I did. And we got the most people registered to vote. Our man who ran that part got top recognition from the Democratic Party for registering the most voters. He was gay. He went to all kinds of places and he got people to register to vote. He didn’t go onto a street corner, he went into the glory holes and the bars and the bathhouses and sat there. He basically said, “You register to vote and then you get the prize.” And little by little they began to realize that if we stick together, we can do something. I was preaching that 30 years ago. My platform when I ran was “Equality Before the Law.” The San Francisco Court House had just been built and that was the slogan on it and I said, “This is what my slogan will be. I’m going to take it and shove it right down their throat.” I saw that there were two interpretations of the laws and that they were trying to make gay people second rate citizens. I’ve never been a second rate citizen. I learned a lot about the law. I realized that you had to have a party endorsement to run for public office and neither the Democrats nor the Republicans wanted to endorse me because I was openly gay. So I had to use brinkmanship and threaten to sue them. I’ve always been a Democrat, and they had to allow me to list as a Democrat even though they didn’t endorse me in any way. Then to get on the ballot, it (took) 35 signatures. I had to blackmail the 35 people. And then when you ran for office in the city it was not according to districts. It was open. After I made the election they came to see me at the Black Cat. Politicians. They wanted to see who was crazy enough to say that they were gay and to run for public office. They thought I was just a starving entertainer looking for publicity to make money. They found out that I was not a starving entertainer, that I was making good money and that I was sincere. They were flabbergasted. But that opened the door. That made politicians and other people realize that there were gay people out there. For Supervisor, you normally have three to five positions open and at the most you might have ten people running. The time that I ran, there were five positions and nine people were running. The filing deadline to run was ten hours away, and I saw that I had a chance. They got nervous, and within those ten ours the nine had increased to thirty-three people. A musician, a garbage collector – oh, they went out and got anybody they could find – thirty three people running for five positions! The most there had ever been up until that time. It was done specifically to weaken the pool (because I was in it). Well, I came in ninth! Out of thirty three, that’s not bad! So, you see, that’s what they did. I could have gotten more votes, but the gay community is our own enemy. But, by the next election, the gay community politicians knocking at the door saying “I would like to talk to you.” I’d proved my point by saying there were 10,000 voting queens. And 10,000 voting queens is a good block. All we have to do is stick together. Shortly after that we elected a sheriff. Shortly after that we got mad and we defeated a man running for mayor. In other words, the politicians of San Francisco realized we were important. Just like today, conventions realize there is a caucus made up of gay people. At one time, they didn’t pay any attention. But now they do. As little as I may be, I’m part of the history. And no matter where you are at, and you don’t know your history, you don’t know where you are going. I believe what I did then has helped make gay people understand that they have to be part of the community that they live in. That is what the Court system has done. The Court system was organized in San Francisco to be part of a community. How are you part of a community? By getting out there and sweeping the streets with the straight people. By getting out there and helping the poor with the straight people. By letting people know that you are gay and you are out there working with to improve your city. I think what I did made the gay community wake up to the fact that they had to get out there and be part of the city. Be part of the community. Take a place in it. And that is what the Court system is. It is not only to raise money – it’s getting out there and doing it. I want to be remembered not as the little Latin that sat on table tops and sang “God Save the Nelly Queens.” I think I’ve done a little bit more in this world. I want to be remembered for the good things that I’ve done. I have achieved something. I was the first. I was the first to organize a gay non-profit corporation in the state of California. I did it. It was The League for Civil Education. And that became SIR, the Society for Individual Rights.